After the most epic, dark and cold winter in recent memory, I am completely embracing the warmth. Spending lazy afternoons outside with the kids, lazy evenings reading on the patio and many a delicious dinner cooked on the grill. If only it were actually a bit warmer this summer. But whatever. I remember when I used to think that meat was the only thing that you could grill, but I've since been introduced to a whole wide world of grilled vegetables and fruit (I haven't quite made it to grilled pizza yet, but it's on my list!). Dinner these days often consists of me prepping a basket of veggies, some sort of protein, and having some sort of starchy side for the kids and hubs (rice, potatoes, quinoa, etc.). It's simple, but it's SO good. 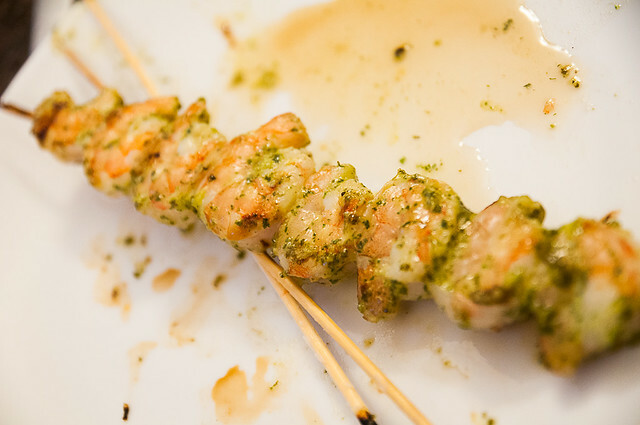 These shrimp skewers came about because I had shrimp on hand, and rather than grilling it plain, I decided to dress it up with something. And I ran out of time to marinate it. So this is really quick and easy and requires no advance planning (which is perfect for the lazy mood of summer). As for the veggies, I've yet to find a veggie combination that wasn't somehow made more delicious through grilling - I recently picked up spray coconut oil from Costco, so I spray my basket, load it with veggies (make sure the slower-cooking [i.e., denser] veggies are cut smaller) and then for the last five minutes of cooking, I dress the veggies with some sort of seasoning (ponzu, in this case). I kept the broccoli larger, because I prefer it almost raw, as do the kids, and I sliced the carrots super thin on my mandolin, because otherwise I find they just don't cook very well on the grill. Last, peppers and onions are always great - just have to make sure I cut them large enough so they don't fall through the cracks. I spray a bit of extra coconut oil on the veggies too. 1. Thaw your shrimp and peel it. 4. 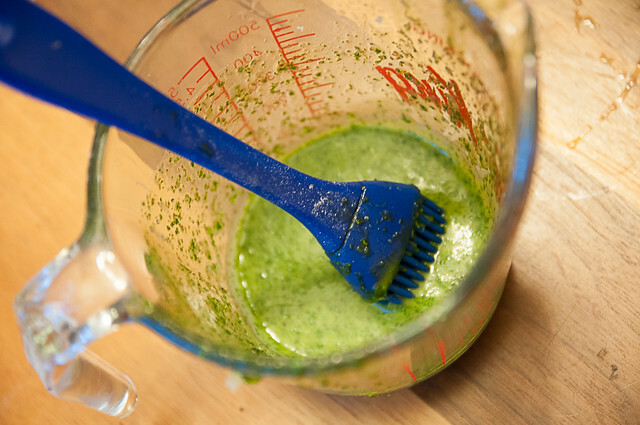 Meanwhile, in some sort of mixing appliance (I used a measuring cup and an immersion blender, but any blender, food processor, magic bullet-type deal will work....alternatively, chop everything as fine as you can), combine the cilantro, garlic, honey, olive oil, lemon juice, salt and pepper. You can taste it if you want, but given that it's just a glaze, it's pretty intense and not that enjoyable on its own!). 5. Put your skewers on the grill, and brush with the glaze (you could marinate it in the glaze as well, if you're planning/prepping in advance). Grill for about 3-4 minutes per side (which will depend on the size of your shrimp - they are done when they are opaque all the way through), and when you flip them, brush the other side with glaze. Flip at least one more time (you will have cross-contaminated your shrimp if you dipped in the same bowl and used the same brush as you did on the raw side....and foodborne illness will definitely kill the patio buzz....so cook thoroughly! Enjoy - they are really delicious! 1. Spray your grill basket or brush it with oil. 2. Chop veggies and combine, and you can either drizzle or spray a bit more oil. 3. 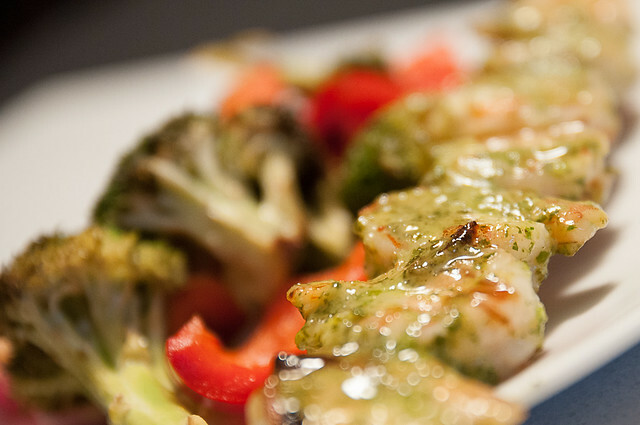 Grill, stirring every couple of minutes (like a stir-fry) and when the veggies are close to done, sprinkle about 2-3 T of your favourite seasoning (soy sauce, ponzu, salad dressing, hot sauce, etc.). Enjoy! Veggies are done when you are happy with them. I like mine practically raw, so they are on for about 10 minutes, but if you have them cut larger, or you prefer them more cooked, then you'll want to cook them for longer. These look amazing. 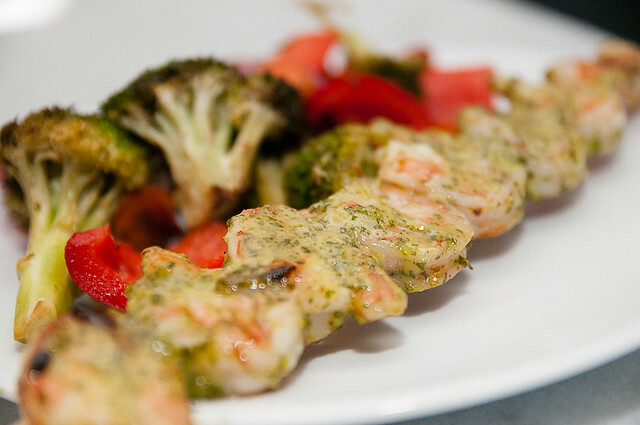 I'm quite recently into shrimp and love any recipe that doesn't require hours of marinating. Will be trying!